On May 25, 1983, the Disneyland attraction Pinocchio’s Daring Journey opened in Disneyland. A Pinocchio-themed attraction had long been in the works at WED Enterprises, but it wasn’t until the opening of the new Fantasyland on this very day that the attraction became a reality. Surprisingly, this attraction opened in Tokyo Disneyland a month before the Disneyland version, as the timeline for Tokyo Disneyland’s grand opening resulted in the attraction opening before Fantasyland’s revamp was finished. The attraction takes guests through the events of the classic film, beginning at Stromboli’s Puppet Theater. 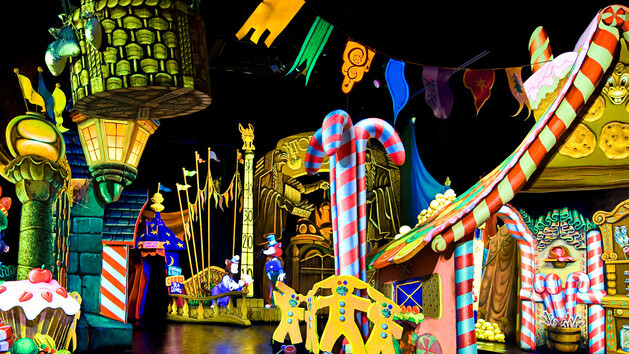 Known as a “dark ride,” the attraction involves show lighting with the figures painted in black light paint, illuminated with ultraviolet light, along with several other special effects. Posted in Uncategorized and tagged 1980s, Attraction, Disney Park, Fantasyland. Bookmark the permalink. I never even knew there was a Pinocchio ride!!! I’m from Orlando and we don’t have that here at Walt Disney World.